Lexington, Virginia is nestled in the Shenandoah Valley between the Blue Ridge and Allegheny Mountains. Folks are drawn to this beautiful area for its scenery, changing seasons, storied past, outdoor recreation, abundant wildlife, quaint villages, cultural activities, and the warmth of the people. The valley and surrounding mountains offer an interesting combination of the quiet beauty of country life, the culture of college town communities, and fascinating Indian and Civil War history. The autumn color begins on the ridge tops of the Blue Ridge and Allegheny Mountains and slowly descends into the Valley. Winter brings shimmering frost or a dusting of new snow. Night skies are filled with stars. The Indians reverently termed this valley, “Shenandoah”, meaning “daughter of the stars”. It might surprise one that drivers wave as they pass on country roads. Strangers speak to one another in the local shops. Virginia is the home of some of the finest colleges and universities in the country. Washington & Lee University and the Virginia Military Institute are located in Lexington. Southern Virginia University is close by in Buena Vista. Many other colleges are close to an hour’s drive. Not only do these colleges provide an excellent education, they offer lectures, music, games and events for area residents. For those interested in the performing arts, Lexington has Lime Kiln Theater and the Lenfest Center for the Performing Arts. In Staunton there is Shakespeare’s Black Friars Theater. In Roanoke there is the Jefferson Center. All offer quality entertainment throughout the year. Lexington is the home of the Stonewall Jackson’s House and Museum, the George C. Marshall Museum, and the R.E. Lee Chapel and Museum. The Frontier Museum in Staunton traces our cultural and historical past. Recreational activities are available at a variety of outdoor arenas. The James and Maury Rivers offer fishing, kayaking, and tubing. One can camp or hike in local State and National parks, hike the Appalachian Trail, enjoy the scenic drive on the Blue Ridge Parkway, play golf on the world-class golf course at the Homestead Resort and many other fine golf courses in the region. There is something for everyone. For those who live, work, and play in the Shenandoah Valley, there is a strong sense of stewardship for this special area. 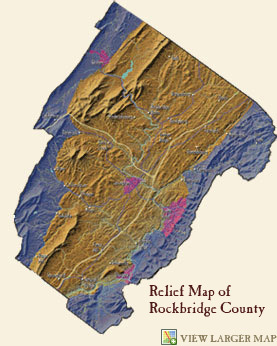 The Valley Conservation Council, the Rockbridge Area Conservation Council, Boxerwood Gardens, and various historic and environmental societies help raise awareness about the preservation of our fields, forests, communities, and history. Life slows to a comfortable pace in the Shenandoah and surrounding mountains. Wildlife abounds. Even on the edge of town, one might see a fox or deer or wild turkey. We invite you to visit our area and savor its quality of life. Our office hours are 9-5 M-F and by appointment.